Thank you for inquiring about our AKC registered puppies. We specialize in Welsh, Soft Coated Wheaten and Wire Fox Terriers, and added Standard Schnauzers to our group (my daughters insisted after seeing them at a dog show and doing some research) a couple years ago, so we occasionally have a few Standard Schnauzer puppies as well. You are welcome to browse through our website and stay as long as you like. If there is anything you need, call or email us. I am always more than happy to talk about my dogs and help you find the perfect puppy for you and your family. Our puppies come with a written one-year health guarantee and receive the best of preventative “well-puppy” care before they go to their new homes. They are checked and approved by our veterinarian, and are current on all vaccinations. Our puppies are family raised with lots of love, are very well socialized, and love people. 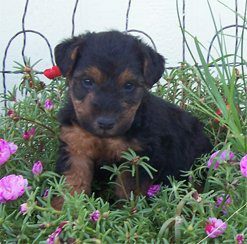 We strive to produce beautiful Welsh, Wheaten, Wire Fox, and Standard Schnauzer puppies that are a compliment to their breed. Keeping proper breed standards in mind is one of our top priorities. We place equal importance on good health and proper temperament. We are confident that our puppies will be a fun and rewarding addition to any family! We live in mid-west Kansas, in the heart of a rural farming community. I was born and raised here as well as my husband, we think it is a great place to live and raise a family. Working as a Veterinary Technician for over 15 years has given me valuable experience that I use every day! My family and I have owned and raised a few select AKC breeds for over 25 years now! We have been active in 4-H/FFA activities for many years, and our love of showing/raising animals led us to raising show/club lambs as well as puppies!! Call or email me with your questions! I love to talk about my puppies!